Our Life Mirrored by Two Suns: Kepler 16b, 2018. A panoramic tapestry room made completely of jacquard featuring an imagined view of recently discovered earth-like planet Kepler 16b. The planet proved to be circumbinary (orbiting two stars or suns), this was previously thought to be impossible, it has two suns one white one red, which would cause the two rainbows depicted here. Kepler echoes the fictional planet of Tatooine - Luke Skywalker's home. Laurance Doyle, the scientist who found it, called George Lucas to ask if the planet could be called after the fictional one, Bolster was interested in how Science-Fiction becomes fact. The panoramic photograph on which the piece is based on, was taken by Bolster while researching at the Allan Telescope Array in Hat Creek in California during his residency at (SETI) The Search for Extra Terrestrial Institute. 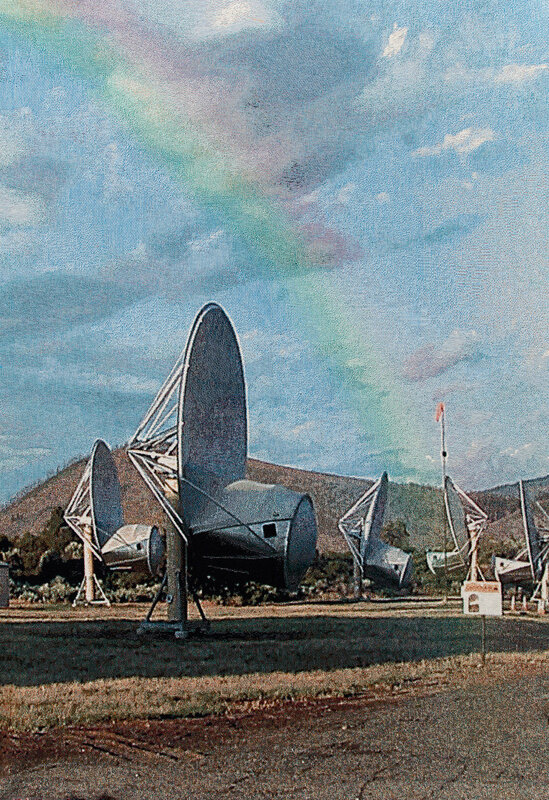 These radio telescopes listen for artificially made signals coming from space. Our Life Mirrored by Two Suns: Kepler 16b, 2018. Installation shot at HIT Gallery in Bratislava, Slovakia. This installation was made as part of Towards A Universal Sublime, a solo exhibition by George Bolster in 2018. At HIT Gallery, George Bolster’s solo exhibition Towards A Universal Sublime features work produced during a two-year residency at the Search for Extra-Terrestrial Intelligence Institute (SETI), and research completed at NASA Ames. With artworks in multiple mediums including drawing, textile, and film, the exhibition is centered around The Moon, McMoon’s, and the Moon Museum, 2016, a film in which Bolster conflates the past, present, and the future, and the necessity for space exploration. The film begins with The Moon Museum, which was the first art object – a small ceramic wafer containing artworks by six prominent artists – to be unofficially sent to the Moon aboard the Apollo XII in 1969. Instigated by American artist Forrest Myers, it featured his own work along with contributions from Andy Warhol, John Chamberlain, Claes Oldenberg, David Novros, and Robert Rauschenberg. Multiple narratives run simultaneously through the piece, from the multicultural narrative of human fascination with the Moon, and the Apollo Missions, to the Moon as the answer to the question of how to preserve our collective human cultural legacy. Bolster’s film features interviews with artist Forrest Myers, and scientists Laurance Doyle, who worked on NASA’s Kepler Mission, Jill Tarter, Cosmologist and former SETI Director, (who was played by Jodie Foster in the 1997 film Contact, based on Carl Sagan’s novel of the same name), and Douglas Vakoch, Director of Messaging Extra Terrestrial Intelligence (METI), who discuss the Moon from a variety of scientific perspectives. Bolster's use of documentary format is combined with multiple, non-linear narratives that explore contrasting ideas based on fact and science-fiction. Research conducted while in residence at SETI prompted Bolster to consider how art and cultural artifacts will be conserved over the next 100 years, given the dramatic changes in climate that are being experienced globally. The selection of specific objects and more broadly what forms of cultural production might be saved, have implications in terms of the monetary and cultural value of art objects. Bolster posits that the decision to save specific objects might not be made on an aesthetic basis, but that they will likely be made based on pragmatic concerns of weight, scale, and cost. In Proposition One: Moon Museum of Architecture featuring The Glass House by Philip Johnson, 2017, Bolster presents us with the architecture of Phillip Johnson’s seminal modernist masterpiece The Glass House, encased within a Buckminster Fuller-style geodesic dome, and, in Proposition 2: Museum of 20th Century Art, Interior with Rabbit (1986), 2018, an intimately scaled metal sculpture by Jeff Koons is pictured within a Fuller-style dome. Bolster proposes the Moon as the perfect site for cultural conservation, with its lack of atmosphere. While a museum built on the Moon might seem like the perfect solution to preserving human cultural legacy as it will cause no further damage to planet Earth, Bolster’s drawings and jacquard textile collectively suggest how the reading of our cultural artifacts will undoubtedly shift in a new atmosphere and landscape of whatever future our society faces. Towards A Universal Sublime is guest curated by Sara Reisman.